Professor Orkan explains aspects of the experiment. The building blocks of cellular energy. To understand biological design, we need an understanding of energy, particularly as it pertains to the interface between the chemical and the biological. While many of us can think of complex definitions of the term energy, for our purposes it means the capacity to cause change. As it pertains to the cell, sources of energy can be light or stored in chemical bonds. The cell uses this energy to do some function then outputs waste, heat or useful molecules — energy in another form. The process of taking in inputs and producing outputs is what we call metabolism. On the cellular level, this process does not simply happen once, but rather happens throughout a series of smaller biochemical transactions known as metabolic pathways. 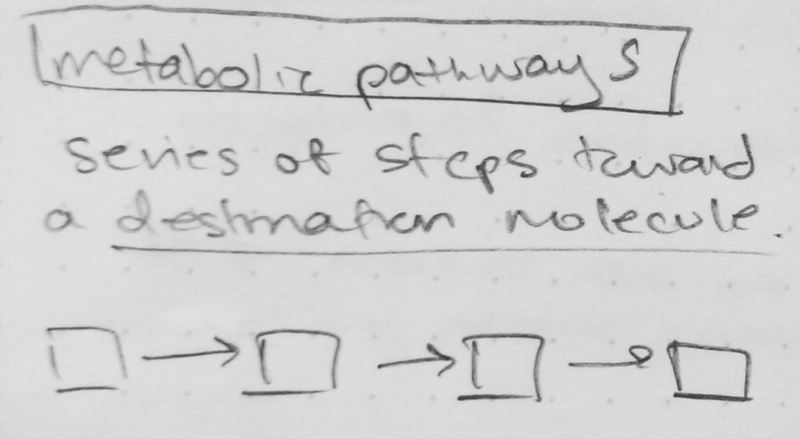 In a metabolic pathway, the outputs of one step in a series can used by another. This process continues until a destination molecule is achieved. The notion that the energy used in one process can then be used for another process actually speaks to a general set of laws about energy called thermodynamics. In metabolic pathways, we see a representation of these laws. For example, living things cannot create energy, nor destroy it. Through metabolic pathways, energy is never output without some kind of input source of energy in the first place. Moreover, energy simply changes in form or structure throughout the process. We spent some time on one particular thermodynamic principle: the state of entropy (or disorder) of the universe will increase over time. Yet this seems to conflict with the high organization of living things. One problem of presenting this conflict is that it is often from the human perspective. From our perspective, we are highly organized biological beings, surrounded by other living things with similar complexity. Evolution has contributed to the existence of highly organized creatures through time, and this seems contradictory. Yet from the perspective of the universe, the entirety of life on Earth, including human existence is but a mere speck in an inconceivably vast system, in both time and space. From this perspective, we are higher order beings, but our order ultimately serves to increase disorder in the universe. For example, we waste a lot of energy in the form of heat by simply living and breathing, taking energy from sources like our food (carbon) and releasing it back into the universe in the form of carbon dioxide. Endergonic (first line) vs. exergonic (seconf line) processes. Exergonic reactions are favored by the universe because they are spontaneous and don't require additional energy to occur. Endergonic reactions are not spontaneous and do require energy to occur. Thus, life is simultaneously composed of endergonic and exergonic processes, the former taking energy to build more complex things (decreasing entropy), and the latter releasing energy to break things into smaller parts (increasing entropy). Exergonic reactions are spontaneous, meaning they are favored by the universe and don't require additional energy to proceed on their own. Endergonic reactions on the other hand are not spontaneous, as they require energy to occur. How then, does higher order life come to exist, if the processes that build more complex things do not happen spontaneously? The key is ATP, a molecule that makes use of exergonic reactions, coupling them with endergonic reactions, such that the overall reaction is exergonic and spontaneous. Furthermore, ATP is quite versatile due to its intermediate phosphorylation potential, which means it can be both broken down for certain reactions, as well as regenerated for other reactions. We see this happen in our muscles — after draining our muscles of ATP through use, within a short span of time ATP is regenerated and we can use them again. What does this mean for biological design? It means that we need to understand how to harness energy for use in our biological systems. For example, one way in which living things use energy is in the form of motion — or taxis. 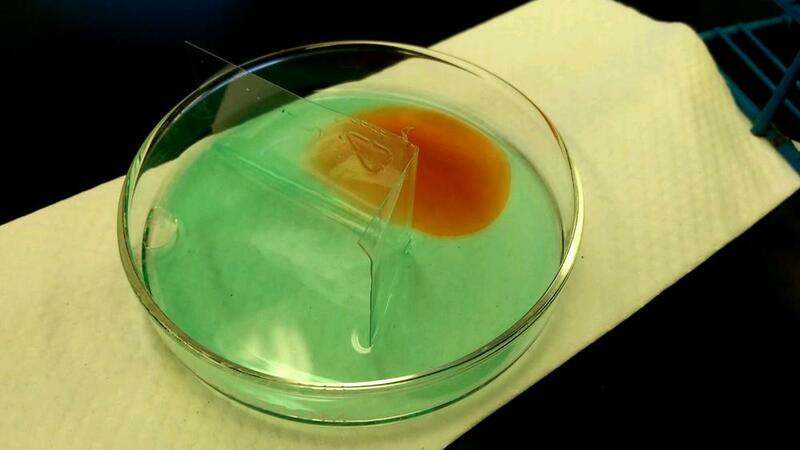 What if we used chemicals to control the way living things moved? This concept, called chemotaxis, is what we explored in our lab. We replicated an experiment done by Martin Hanczyc and his colleagues based on their publication "Dynamics of Chemotactic Droplets in Salt Concentration Gradients." A short video of their work can be find here. Similarly, we used decanol droplets as stand-ins for living matter, and used salt as a source of energy. Our experiment occurred on a layer of decanoate. The decanol droplet would move toward the highest concentration of salt, mimicking lifelike behavior. Our ability to design the intention of this lifelike droplet has significant implications. For example, as these intentions get more sophisticated, and build upon each other, soon we begin to see a tree of larger groupings that include instincts and even feelings. Thus, chemotaxis is but one point on a spectrum of agency ranging from chemical reactions up to feelings and reasoning. Some of us even designed mazes, to test the "intelligence" of our decanol! Aqueous solution of Sodium Deconate and pool of NaCl concentration. Chemotactic movement of deconal droplet in response to concentration gradients of NaCaL. Student adding deconal droplets to the solution. This opens up several possibilities for our biological design work. For example, what if we could implant information inside of these droplets (encapsulation)? What would collections of these droplets do? What about their potential as a means for transporting / retrieving other substances? By understanding the way energy operates within these droplets, as well as their fundamental properties, we have basic tools with which to begin thinking about designing life.